In this BEFORE image, notice the cloudy reflection of the light coming in the windows. In this AFTER image, you can see that the clarity and shine has been beautifully restored. Here is a closer look at the damaged travertine finish. This is the same section of the floor, but after honing and polishing, you can see the individual overhead lights. 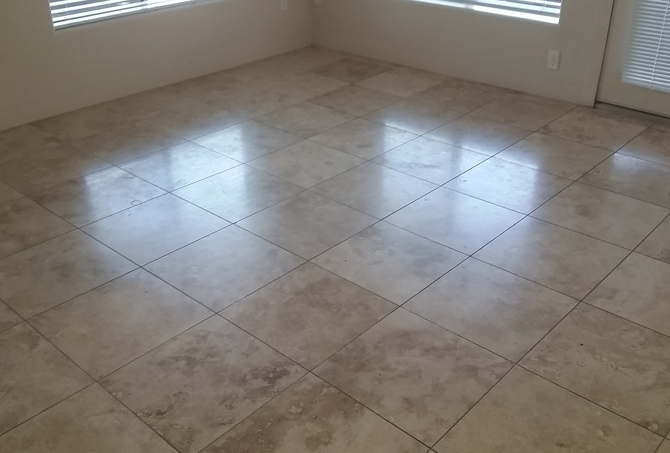 The travertine floor in this Scottsdale home was looking dull and dingy, prompting the homeowner to call Beyond Stone Solutions to inquire about cleaning and whether a coating could be used to bring the factory finish back. 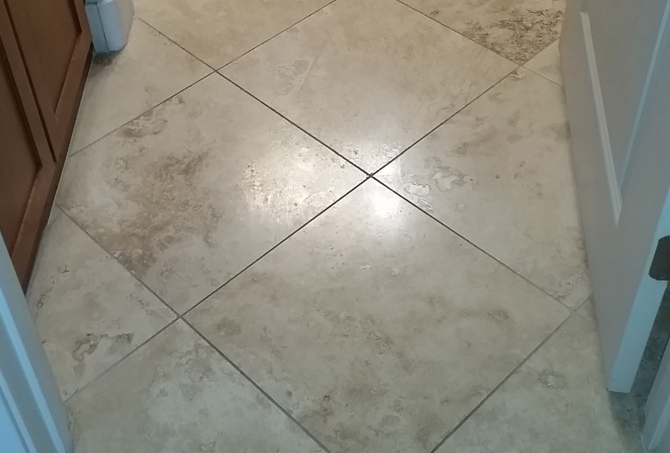 We explained that our professional travertine restoration services rejuvenate the finish naturally, without the need for topical coatings. We masked and protected the wall, cabinets, baseboards, and appliances surrounding our work area. 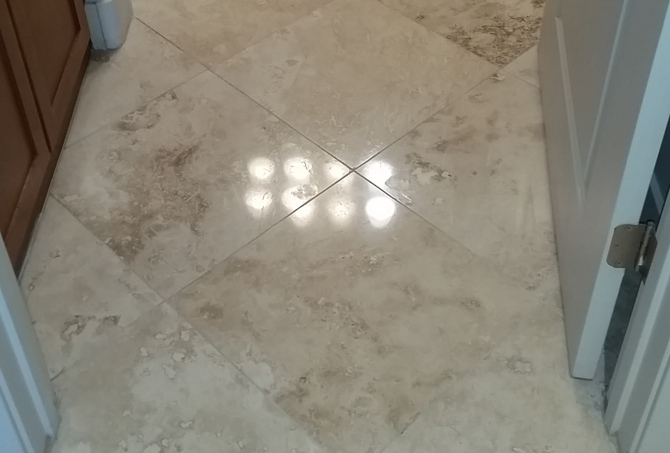 To return the reflective quality to this travertine, we first honed it to remove scratches and other surface damage. Then, we added a light polish to enhance the clarity. Our final step was to apply an impregnating sealer to inhibit staining. The homeowners were very pleased with the outcome. For more information about our travertine services, watch this short video or visit this page. 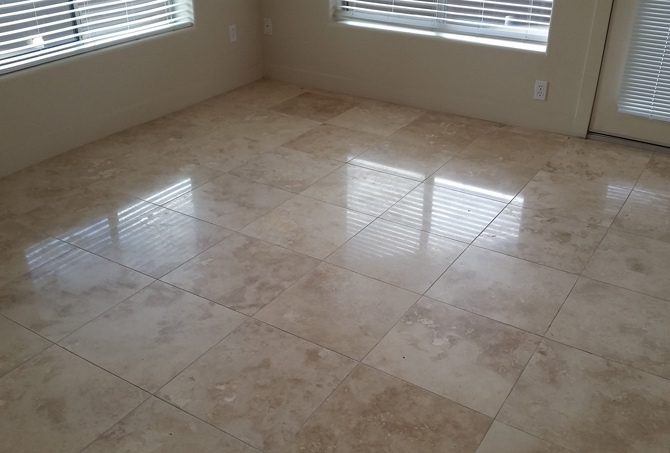 For a FREE estimate on travertine honing, polishing, cleaning and sealing, or any other natural stone and tile services throughout the Phoenix, Scottsdale, and Tempe area, use our contact form or call (602) 993-9800 today.